DuPont Refrigerator Filters install easily and produce great quality water and ice from your refrigerator. DuPont refrigerator filters will remove chlorine taste and odor from your water. Replace your DuPont refrigerator filter cartridges every 6 months. 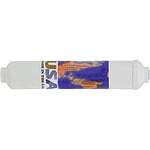 The Omnipure CL10RO-T33 Compatible High Capacity Refrigerator Filter replaces the DuPont WFIR100X and contains antimicrobial product protection that is built in for improved performance and filter life.